Wow – I was just here last weekend! From WEBS, here is a FIFTY PERCENT OFF ADMISSION COUPON – wow! 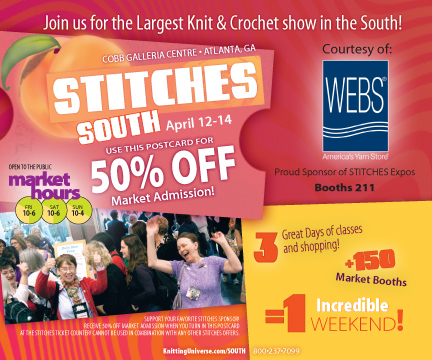 Are you heading to Stitches South this weekend at the Renaissance Waverly Hotel & Cobb Galleria Centre in Atlanta, GA? Mad Men Knitting Pattern Roundup!